Rehoboth Beach Real Estate THE GLADE homes for sale can be found on this page and are MLS searched and updated daily compliments of Rehoboth RE/Max Real Estate Agent Joe Bowski . Contact Joe a RE/MAX Rehoboth Beach Real Estate expert for buying or selling your Rehoboth Beach Real Estate. NOBODY SELLS MORE REAL ESTATE THAN RE/MAX!!!! Holland Glade Homes are commonly referred to as The Glade in Rehoboth Delaware. This is one of the largest communities closest to the Rehoboth Boardwalk consisting of only single family homes. Most all the homes were custom built therefore the Holland Glade community does not resemble a cookie cutter type development. The streets are wide and the lots are spacious. It is surrounded by state wet lands so privacy and a serene setting is secured. 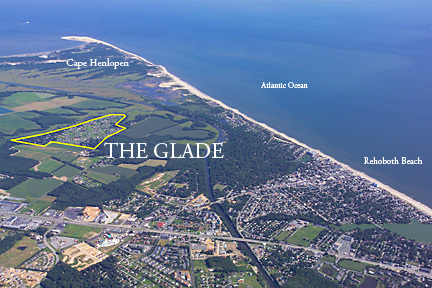 The Glade Homes have a canal way weaves around the east of the community gradually emptying into the Rehoboth bay. Some of The Glade homes have their own private dock /pier and boaters can enjoy heading north up the canal to the Delaware bay or south towards the Rehoboth bay. The Glade is biking distance to the Atlantic Ocean and the famous Rehoboth Beach boardwalk. The Glade offers many amenities and has an active Home Owners association. A very large swimming pool, racquet ball court, tennis court, and fitness center are among some of the amenities offered at Holland Glade. There are man made lakes with kayak launches , and wildlife abounds. The community is adjacent to the Cape Henlopen Bike trail and nature walk which goes from the Cape May ferry launch to the Rehoboth Boardwalk. The trail is abundant with wildlife from deer to bald eagles . Sight seers and photographers dot the trail on every weekend.There are quite a few lots left in The Glade to be built upon. There are some minimal foot requirements and getting permitted for a dock may not be possible. However there are always resales to fill the void. Below are all homes currently for sale in Holland Glade and lots left to build.